There are over a billion websites on the Internet. Many of them are made a long time ago and have not been updated with HTML features. As such, search engines move past these websites, and viewers find these websites difficult to read. One of the most important features of HTML5 is its semantics. Semantic HTML refers to syntax that makes the HTML more comprehensible by better defining the different sections and layout of web pages. It makes web pages more informative and adaptable, allowing browsers and search engines to better interpret content. For example, instead of using div id="header" you can use a header tag. In this guide, you will learn how to use new semantic HTML5 tags in a web page creation and how to make content more informative for machines. Here goes logo, navigation, etc. The main difference: we have replaced div tags with 3 new tags: header, main, and footer. header, main, and footer tags are semantic because they are used to represent different sections on an HTML page. These are more descriptive than div tags which make partitioning webpages into tangible sections difficult. Generally, the navigation menu can be put anywhere on a page, it just needs to be wrapped with the . However, it shouldn't be put inside main, unless the navigation is specific for that page. This restriction exists because main elements should only be specific for the page, while header and footer are generally shareable among similar pages. The article tag is used for wrapping an autonomous content on a page. A content is autonomous if it can be removed from the page and put on some another page. The article tag can contain several section tags inside it, like in our example. An article is actually an autonomous section. The section tag is similar to the div tag, but it is more meaningful since it wraps logical groups of related content (e.g. a chapter of an article). The section tag can be also used to wrap the article itself, but we have the article tag for that purpose. As seen above, the aside allows search engines to quickly pull information like author, views, and date. This tag can be also used to enclose additional content that is related to a whole page, not just to a particular article. For example, aside can wrap a sidebar, ad, footnote, and so on. Figure elements on a web page can be enclosed with the figure and figcaption tags. The figure tag is used to mark up photos, code blocks, diagrams, charts, illustrations, and other graphic content. Generally, this tag encloses content that can be moved away into an appendix. Only images related to the content of a page should be within the figure tag (e.g. a logo image). Therefore, images like banner ads shouldn't be inside that tag. However, there is a way to add semantics to a banner ad which we will cover that in the Microdata section of this guide. The figcaption tag represents a caption or legend for a figure. It's optional and can be omitted. Only one figcaption tag can be nested into the figure tag. Even if a figure contains multiple images, there can be only one figcaption for all of them. For instance, photos of people who liked the article could be enclosed with the figure tag. Since that information is not crucial to webpage functionality, it can be nested into the aside section of the article. Notice how the partitioning in the page makes the code more comprehensible and possibly improves browser and search engine content parsing. 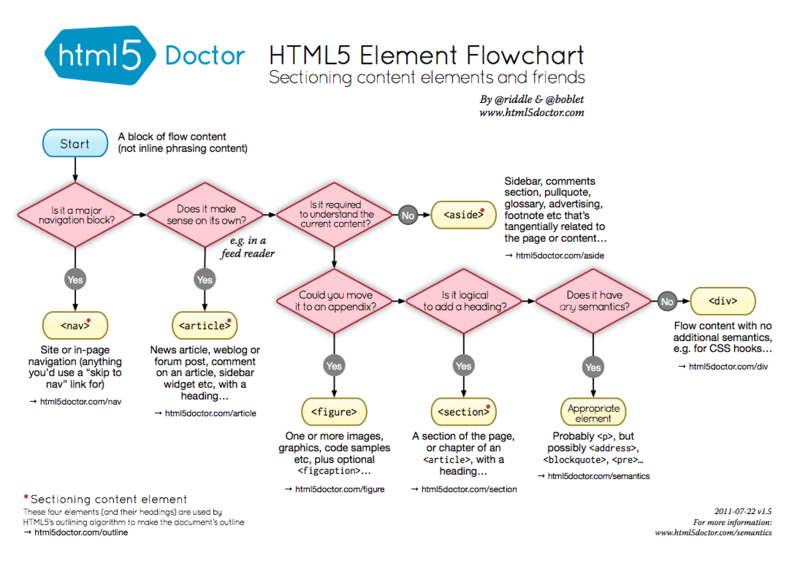 If you are unsure which semantic tag to use in a particular case, you can always follow this great flowchart made by authors of HTML5Doctor. There is obviously much more data in the code above than in the previous code, but there is also much more information for machines. As you could notice, we used the following microdata attributes: itemscope, itemtype and itemprop. So, what do all these attributes mean? itemscope indicates a new group of microdata. A group of microdata is called item. Items contain pairs of properties and values. The type of an item is specified by itemtype. This is actually a URL to a web page that contains information about the item. On that page, we can see all the properties the item could have. We usually use only several properties to describe an item and we define these using the itemprop attribute. A value of a property can be a new item (like address in our example). There is a very useful tool for generating microdata called the Microdata generator. It can save time and teach you how to use microdata properly for various items. According to this table, the HTML5 semantic tags are supported well in the latest browsers versions. For some older versions of the Internet Explorer, Firefox and Safari we can use the HTML5 Shiv or Modernizr (which includes the HTML5 Shiv). This guide covered several advantages of using semantic HTML. We created a semantic HTML layout and used microdata to add more information to the content of the web page. Hopefully, this guide gave you an understanding of how semantic HTML can improve a webpage and search engines interaction. And with more browsers taking on HTML5, semantic tags will inevitably become more common, so mastering them now could hold reward in the future.